Five years ago, on July 27, 2013, almost three million people gathered on Copacabana Beach in Rio de Janeiro. On giant screens spread along the shore, Pope Francis pointed his finger at each person listening: You, and you, and you.... Everyone called to be a saint, young people included. That encounter took place during a World Youth Day, but this particular concern of the Pope has been a constant theme of his. Whenever he has the chance, he encourages young people to take risks and to allow Jesus to enter into their hearts, to go against the current, to not be afraid to dream; to "get off the couch," to set aside the easy comfort offered by screens or by false illusions of happiness; to put on one's shoes and become "street preachers," as he likes to say. In one of his first documents, the Pope highlighted that young people call us to renewed and expansive hope, for they represent new directions for humanity and open us up to the future, lest we cling to a nostalgia for structures and customs which are no longer life-giving in today’s world. Youth always brings new things with it, together with hope. These words – newness, hope – call to mind some aspects of Saint Josemaria's interaction with young people as a young priest. 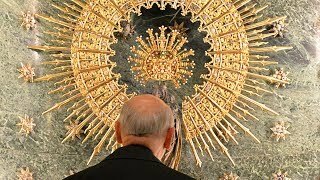 While still in his twenties, he received a light from God spurring him to carry out Opus Dei. He had nothing to contribute: only the fire enkindling his heart that he longed to share with those around him. He also had the conviction that he would not lack God's help. Ignem veni mittere in terram (Lk 12:49), he prayed so often during those years: I have come to cast fire on the earth. The 1930s were difficult years in Madrid, marred by intense religious persecution. Priests often had to face insults as they walked along the street, and an attempt was made to eliminate all public references to Catholicism. Saint Josemaria realized then that one of his priorities needed to be enkindling the light of Christ in young people, who would be the future of the Church and also of the institution that God had called him to found. He was searching for a way to organize a group of university students, to gather them together under some name, some type of association that could be started. The idea came to him in a striking image: a green cross. As Blessed Alvaro later explained, after reading some notes of Saint Josemaria from that time period: The Cross, because it occurred to him on the Feast of the Holy Cross, and also because he was thinking of Saint Peter's cross; and green, the color of hope, because young people are the hope of the Church and the Work. 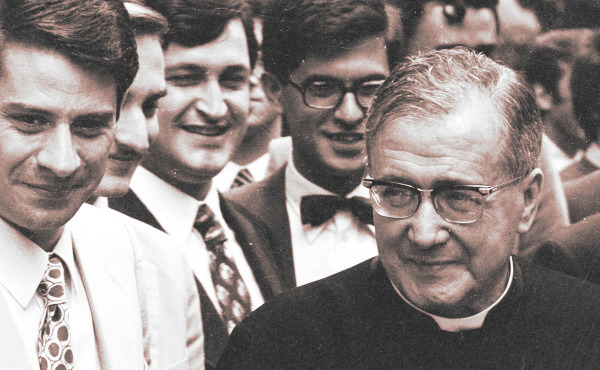 Saint Josemaria's idea never came to fruition in this form, but it was an expression of his desire to reach many people who would let themselves be found by Jesus. He was already praying for them. And right from the start, he decided to ask our Lady for help, under the specific title of "Our Lady of Hope." Six months went by. On Saturday, January 21, 1933, Saint Josemaria organized the first gathering, at a shelter for homeless children where the young priest often went to teach catechism and hear confessions. Only three university students came that day, but Saint Josemaria saw in them the beginning of so many thousands of young people who now attend the means of formation offered by Opus Dei all around the world. That school year, the small group got together every Wednesday, and eventually grew to include nine participants. The last encounter took place May 17th. To encourage them to keep up their relationship with God throughout the summer, Saint Josemaría gave each of them that day an image of Christ on the Cross, raised above the world. He asked them to pray every day the words he had written on the back. As he recalls it, "As I said good bye to those Saint Raphael boys, I gave each of them an image of Merciful Love, on which I wrote the following words that they promised to pray every day: Holy Mary, our Hope, Seat of Wisdom, pray for us. Saint Raphael, pray for us. Saint John, pray for us." Two days before this took place, on May 15, 1933, a small group of children who Saint Josemaria had prepared during the previous months received their First Holy Communion. Ever since his years in the seminary, he had never abandoned the work of teaching Christian doctrine to young children: in poor neighborhoods, and in schools and religious institutions. He encouraged all the young people he knew (also during moments of heightened political tension) to do the same, convinced that the effort to transmit the basic truths of the Catholic faith helped them to grow in their own understanding of it as well as to grasp better other people's situation in life. When he visited the Sevilla Gonzalez family, for instance, Saint Josemaría used to bring laminated cards for the children with simple explanations of the Ten Commandments and the sacraments; he would tell stories about the life of Jesus, and also make reference to events from his own life. He never limited himself to a systematic explanation of ideas, but rather tried to start from the concerns and doubts of his listeners. To earn a little money, Saint Josemaria was also teaching classes of canon law and Roman law in the afternoon, with ten students in each class. At the end of the day, the young priest would remain for some time in the classroom, which often led to a lively get-together with his pupils. The students sensed an opportunity to make known to him their doubts, not just about the content of that day's class but also about life in general. A few of them recall that they would often accompany the young priest on the long walk back to his residence, during which they were the ones who chose the topic of conversation. On December 2, 1931, during the novena to the Immaculate Conception, Saint Josemaría wrote some reflections in his personal notes about the classes he was giving. He concluded that, although he needed to teach for financial reasons, he wasn't satisfied with just giving lessons. He felt the need to go further: to be a saint imparting classes. And he especially felt the need to invite the others to be saints as well. Saint Josemaria was then twenty-nine years old; his students, just a bit younger. He wrote: "Teaching anything: whether it be law or... algebra! Because otherwise, there's no money even for food... Although this has sometimes been the reality of my life, I don't feel I have a vocation for it. But to teach one, two... three areas of Law to young people who want to learn, and who can be set ablaze with the fire of Christ... This yes: this I sense I have a vocation for." Back then, Saint Josemaría only had dreams. Some people even called him "the dreamer" when they learned of his plans and high ideals. But he had the strength to put himself at our Lord's disposal to make them a reality. As Pope Francis told 70 thousand young Italians this past August, in a meeting that took place in the Colosseum two months before the Synod for young people: This is the work you must do: to transform today’s dreams into the reality of the future, and for this it takes courage. He closed by saying: And the dreams of young people are the most important of all. A young person who cannot dream is an anesthetized young person; he or she cannot understand life, the power of life. Dreams awaken you; they sweep you away; they are the most luminous stars, those that indicate a different path for humanity. Francis, Prayer Vigil with Young People, 27 July 2013. Apostolic Exhortation Evangelii Gaudium, no. 106. Cf. Pedro Rodríguez, The Way, Critical-Historical Edition, Scepter, p. 927. Studia et Documenta [SetD] (6) 2012, p. 402. Intimate Notes, no. 1029, cited in SetD (3) 2009, p. 169. Intimate Notes, no. 441, 2 December 1931, in Pedro Rodríguez, The Way, Critical-Historical Edition, Scepter, p. 928. Francis, Prayer Vigil with Young Italians, 11 August 2018. St Josemaria wanted to change the world too, that's why he understood young people so well.